The only things I switched up in the recipe was the 1/3 c. flour that is called for, I replaced with 1/4 c. bread crumbs and 1/4 c. flour, and only did a little pinch of baking powder, and did more parmesan. I also should have used my nonstick skillet but used the stainless saute pan, and rather than flipping it I cooked it til brown and crisp on the bottom then finished it in the oven at 450 for 20-25 min. I made this soup the other night with our potatoes from the garden, so I can freeze it and have it to pull out for dinner on those chilly winter nights to come. I’m not so sure any of it is going to make it to the freezer. Can’t. Stop. Eating. It. Even with the weather so warm right now, and usually I don’t care for hot soup in the summer, I’ve been enjoying it for lunch and dinner. So comforting, soothing, heartwarming, creamy, and flavorful. I basically did Ina Garten’s recipe from my cookbook, Back to Basics, and changed it up a little. The roasted potatoes and leeks, sauteed shallot and garlic, white wine, chicken broth, parmesan, whole milk, parmesan, and a sprinkling of thyme and parsley all make for the best flavor! 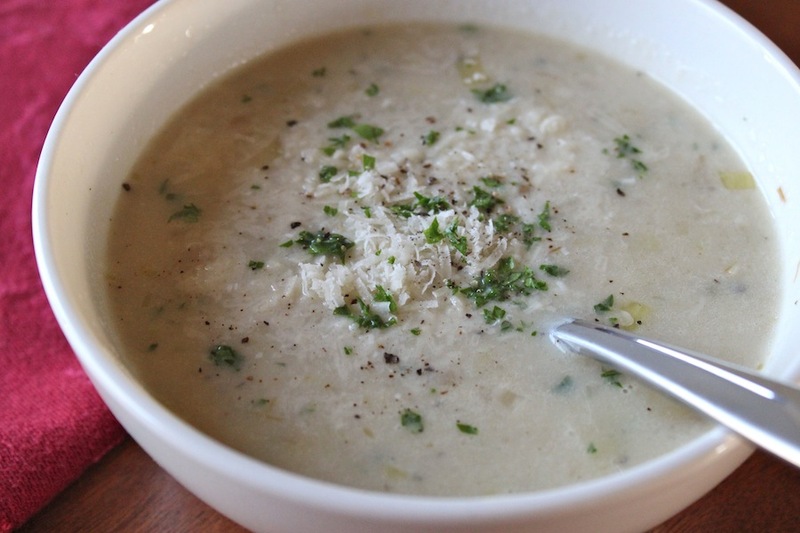 Really, if you plan on making potato soup sometime soon, you’ve got to cook this one up! 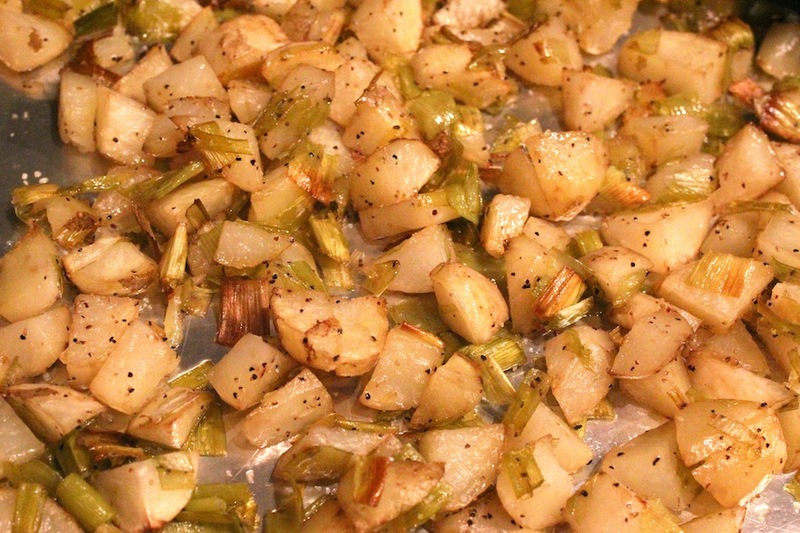 Spread the potatoes and leeks out in a single layer on 3 baking sheets, drizzle well with olive oil and s+p and toss. Roast at 400 F for 35-40 min. In a large stockpot heat the olive oil, add in shallots, then garlic and saute til a few min., then toss in two sheet pans of the roasted veg, setting aside the third pan for later. Saute only a couple min., pour in white wine and let cook a few min. Add about 1 qt of broth (enough to make it thin enough to puree). Use an immersion blender to puree the mixture in the pot (or puree batches of it in a food processor). After it’s all pureed in the pot, heat back up, add in 4-6 c. whole milk (or cream), parmesan, and sprinkle in 1 T. fresh or dried thyme, fresh parsley, and s+p to taste. Do not let it get to a full boil, but a gentle simmer. 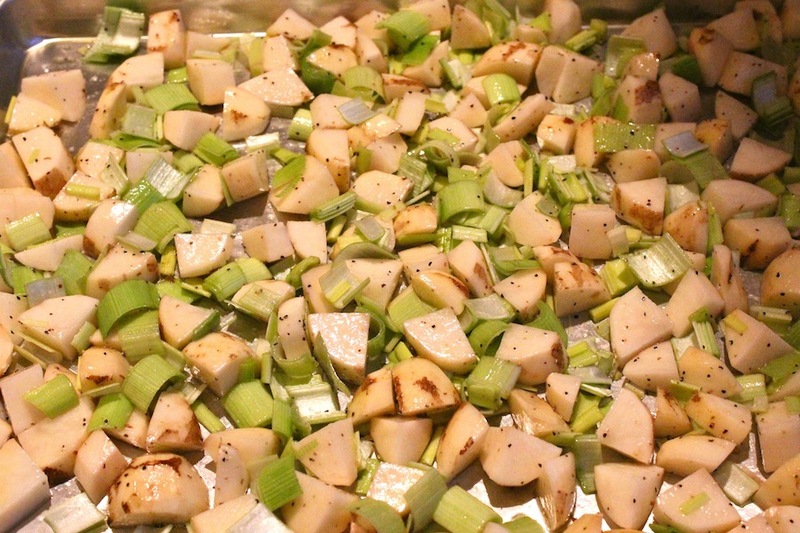 Add in the last baking sheet of roasted potatoes and leeks to the pureed soup, stir up and enjoy! 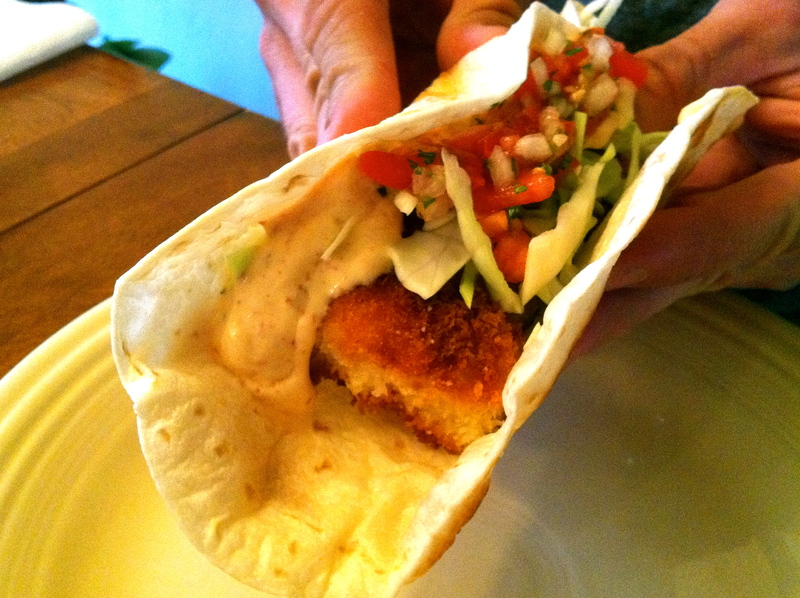 Ever since spending the summer of 2004 in Cordova, Alaska, I have been making these fish tacos. Not long after I arrived to this small, remote, and breathtakingly beautiful fishing village, I found a quaint little red school-bus-turned-kitchen, Baja Taco, that served up the best salmon and halibut tacos, ever. After my first visit, I was hooked. 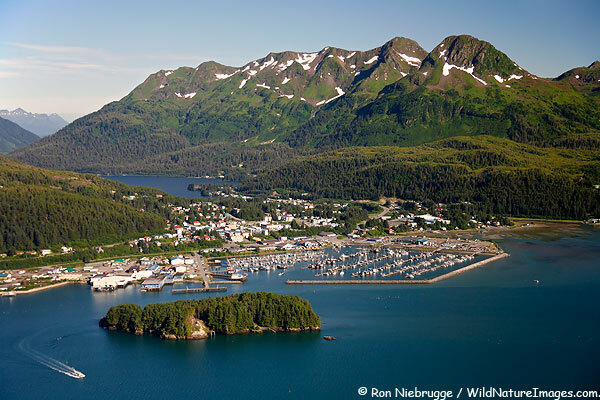 The owner lady got her supply of Copper River Salmon and Halibut from her husband who was a commercial fisherman. Two small, but very filling, tacos were served up in this little red basket and you had your choice of fresh wild Sockeye or Silver Salmon, or Halibut. The fish is beer-battered and wrapped up in a flour tortilla along with shredded cabbage, chipotle aioli, and pico de gallo…with a lime wedge of course. Absolutely delicious, fresh, flavorful, and such a treat. And so, ever since I’ve been making my own similar version of what I discovered there. The only difference really is Panko bread crumbs. 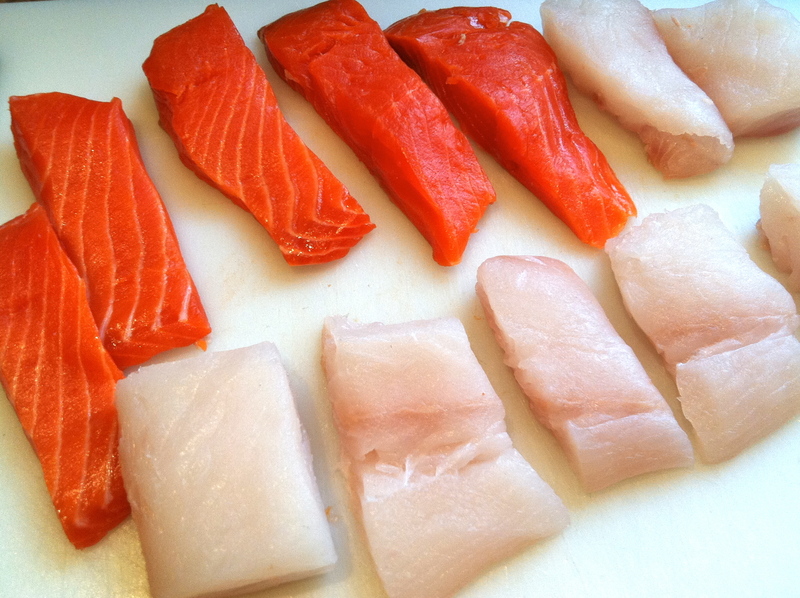 Be sure to find some good quality fish, preferably salmon or halibut, and good fresh ingredients. Great textures, flavors, and colors! 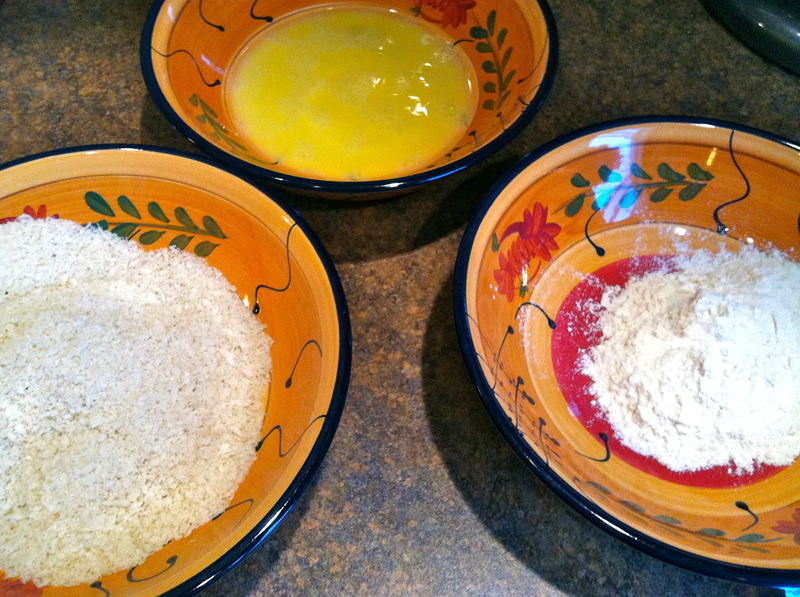 Blend all ingredients in a food processor or blender until combined and smooth. Add the chipotle according to your taste and preference for heat.. they do add quite the kick. Refridgerate until using. Combine in a bowl, refrigerate til needed. 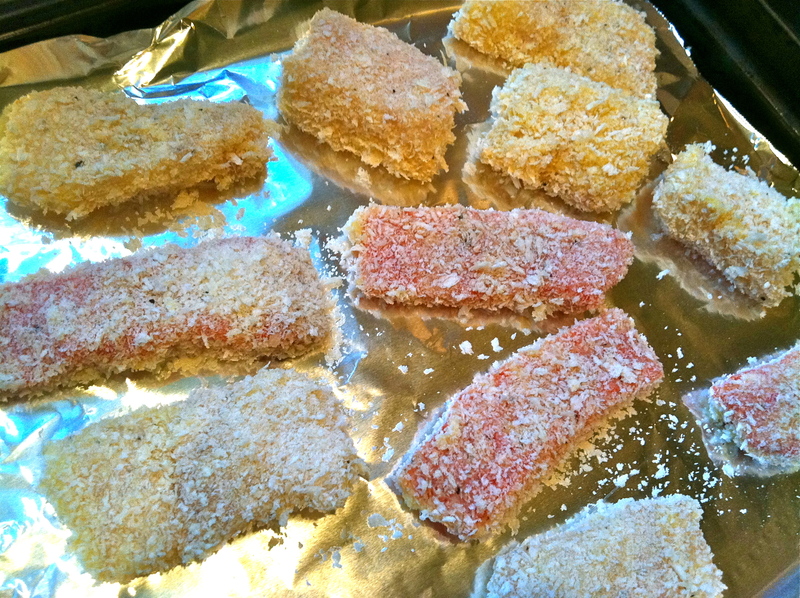 Set each ingredient in three seperate bowls, coat each fish fillet in the flour, then egg, then Panko. Have a large skillet with about 1/2 to 3/4 c. oil (I use Canola/Vegetable/Olive Oil mix) heated to 350 deg. 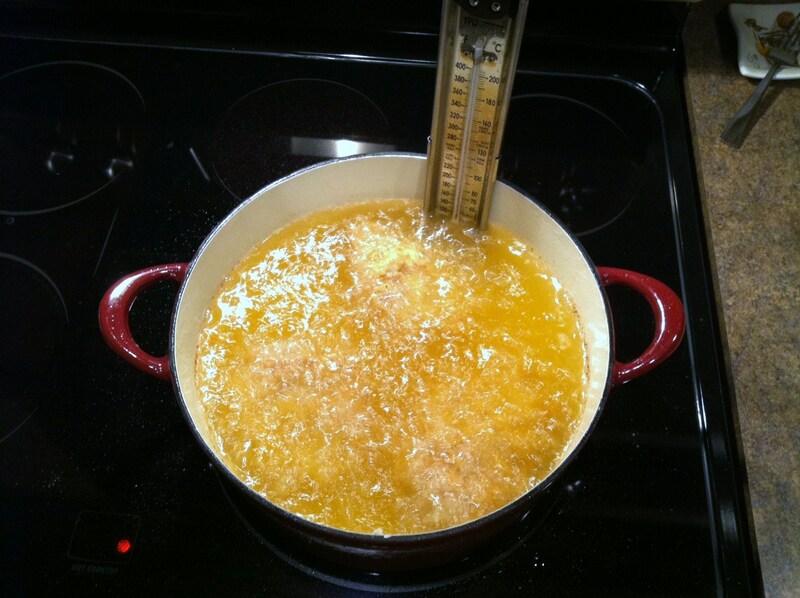 F., or til a pinch of bread crumbs dropped into oil sizzles and bubbles and floats, and doesn’t drop to the bottom. Lay the fish fillets in the hot oil. 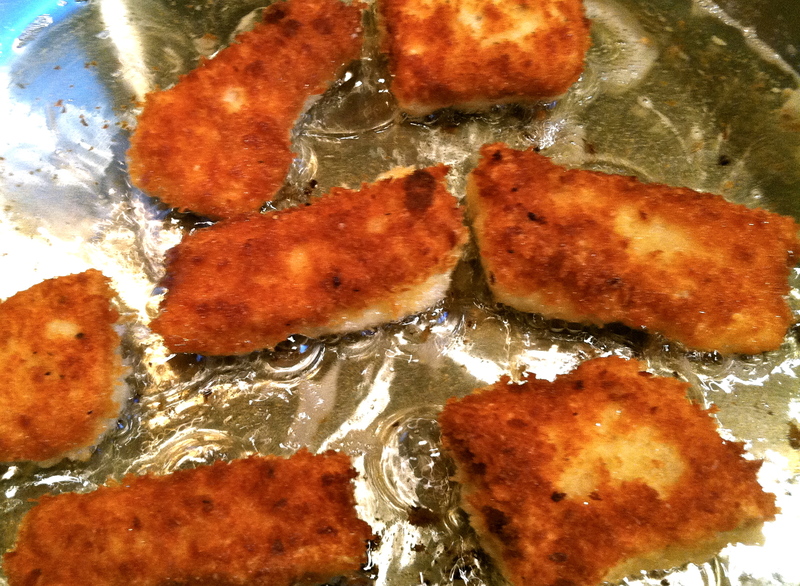 Cook until golden on each side yet still tender, about 3-5 min., depending on the thickness and size of fish sticks. 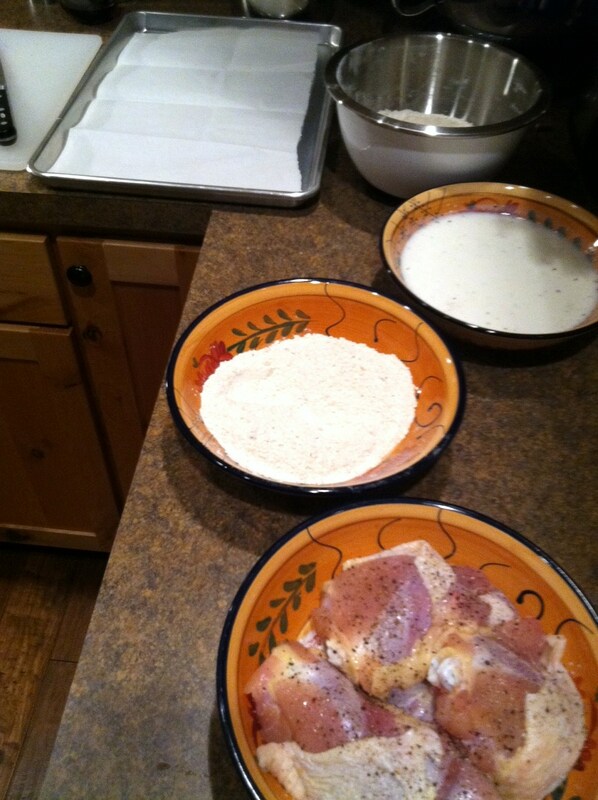 Lay onto a baking sheet/plate lined with paper towel. 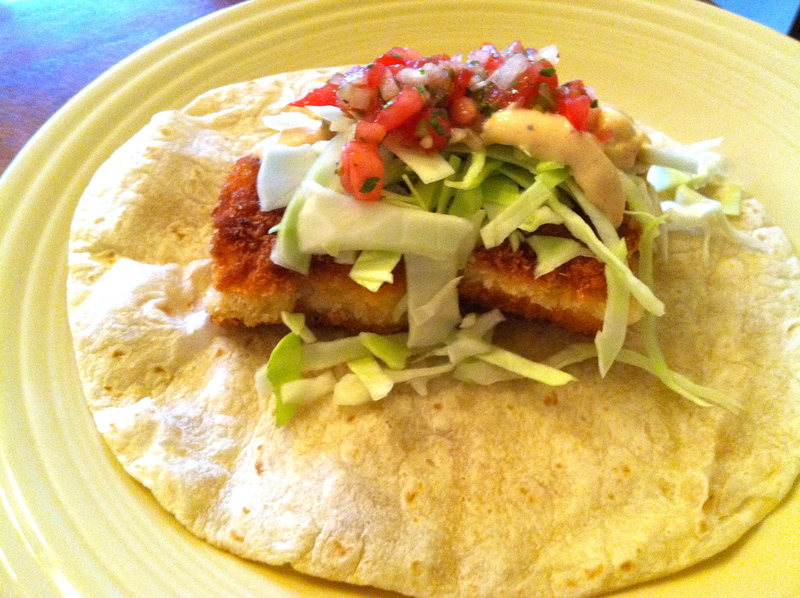 Toast a flour tortilla in a skillet til a little crispy and golden, fill with fish stick(s), cabbage, aioli, and salsa. Enjoy! The other night I made Taco Pizza for dinner, and I just have to share this! You really don’t even need a recipe… more like just sharing the idea. 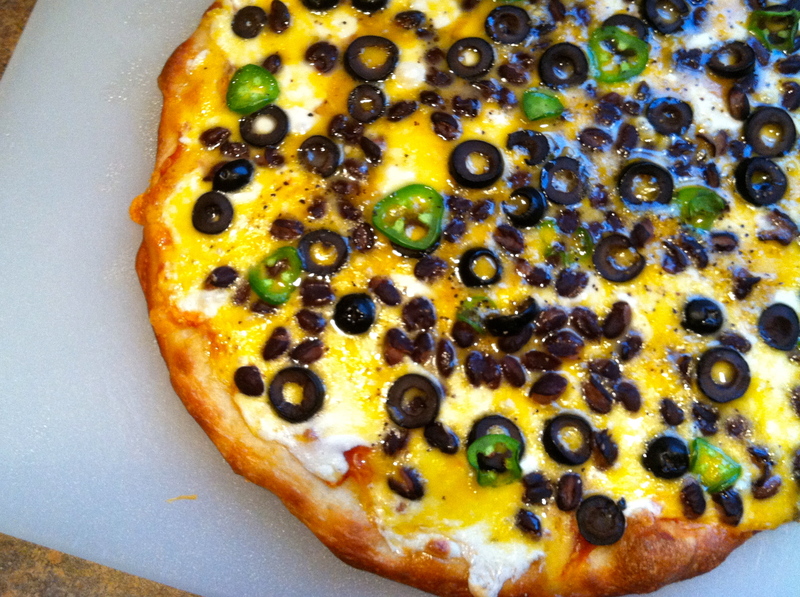 Taco Pizza and Cheeseburger Pizza are two of my fav pizzas to make at home. Very tasty and just a good home-cooked satisfying and delicious dinner. I love having mexican food for dinner, with all the fresh tomatoes, avocado, black beans, olives, salsa, sour cream, cheese, jalepeno… lots of different flavors, textures, and colors. SO good! 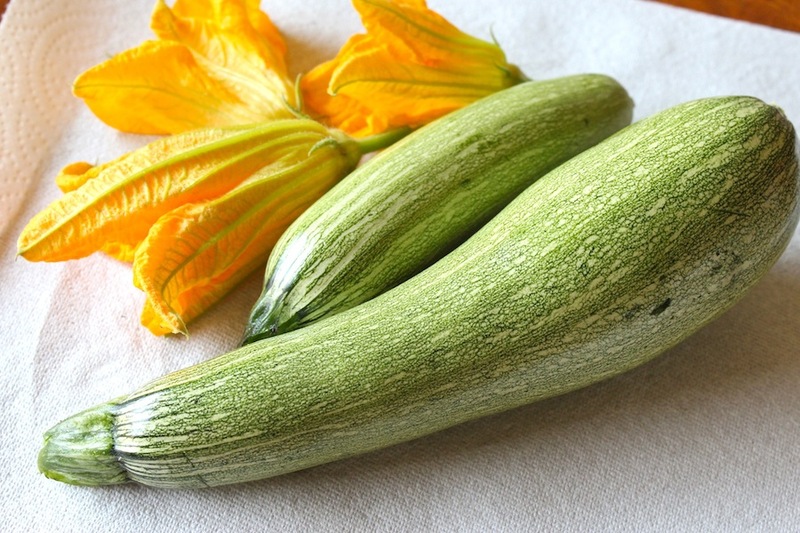 The dough I make is found here, and over here on my cousin’s All Things Italian store blog. Par-bake your pizza dough for 8 min. at 425 or 450 deg. F., take out of oven and cover with salsa and toppings. 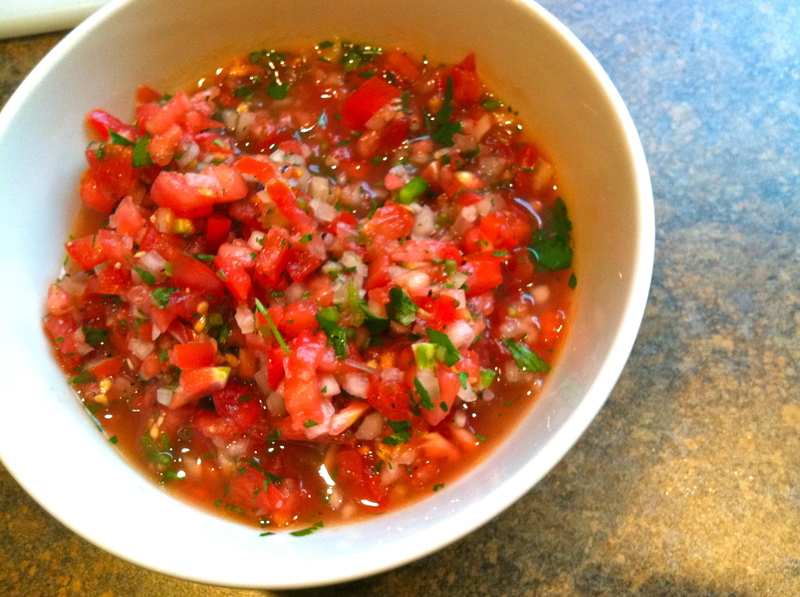 Rather than a traditional tomato sauce base, I spread on salsa (we love it a little hot). 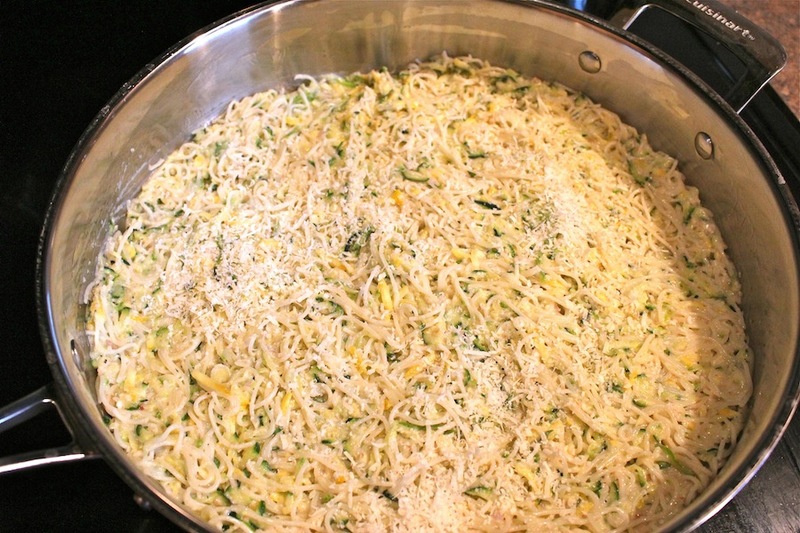 Then lay on slices of fresh mozzarella and cover with grated cheddar. 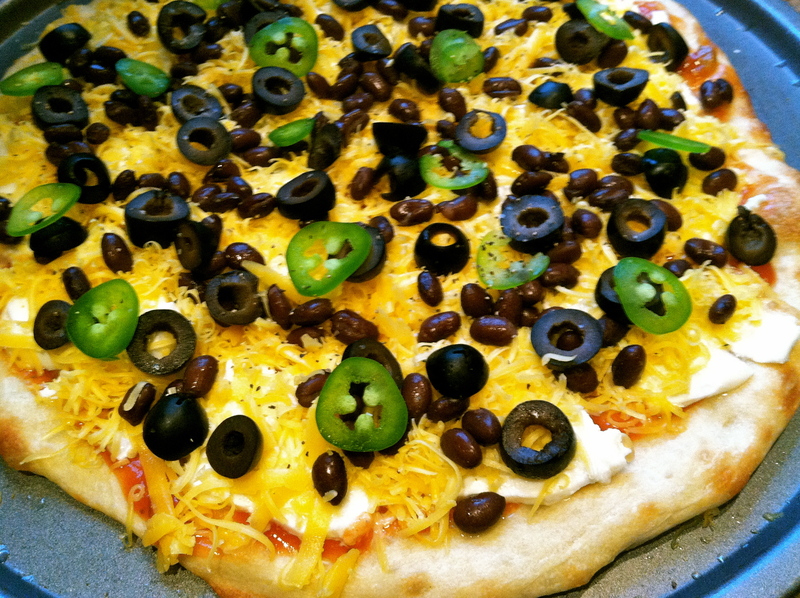 Sprinkle on the black beans, sliced black olives, sliced/diced jalepeno, even some taco-seasoned browned burger if desired, then bake another 8-ish min. or til cheese begins to get golden and it’s all cooked to your liking. 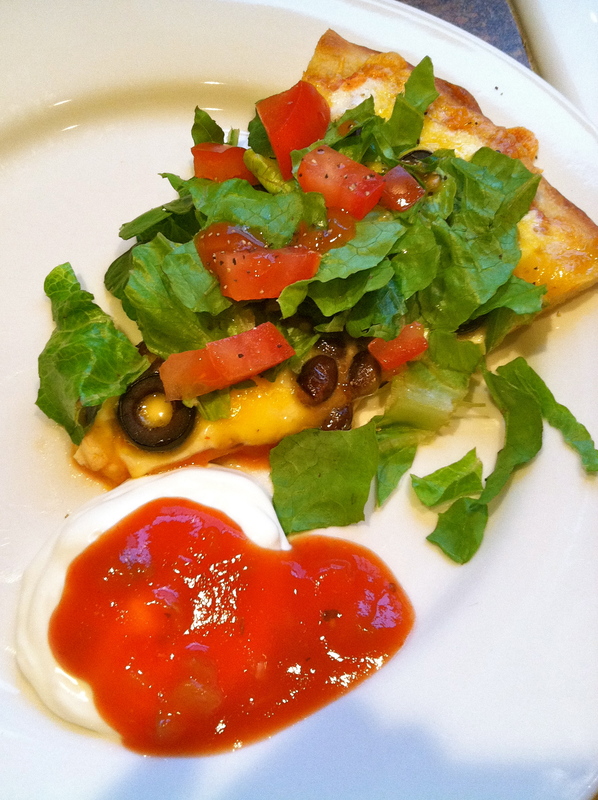 So yummy, all the delicious cheesy indulgence of any pizza, with some freshness added with lettuce, tomatoes, avocado, salsa, and sour cream. Fish is one thing I love cooking up, and there’s so many different ways I like to make it. I especially love salmon and halibut. After spending two summers in Alaska catching and cooking up fish, I kind of got spoiled on the wild and freshly caught King, Silver, and Sockeye Salmon, and Halibut. After living there even for a short period, you kind of become a ‘fish snob’ and get picky on the type of fish you eat. The taste, texture, and color of farmed fish vs. wild fish is very noticeable, and wild just reigns supreme! I just recently found some wild Copper River Sockeye Salmon and made this dish, served along with a salad, sauteed asparagus, and some of my homemade bread. My husband and I loved it. 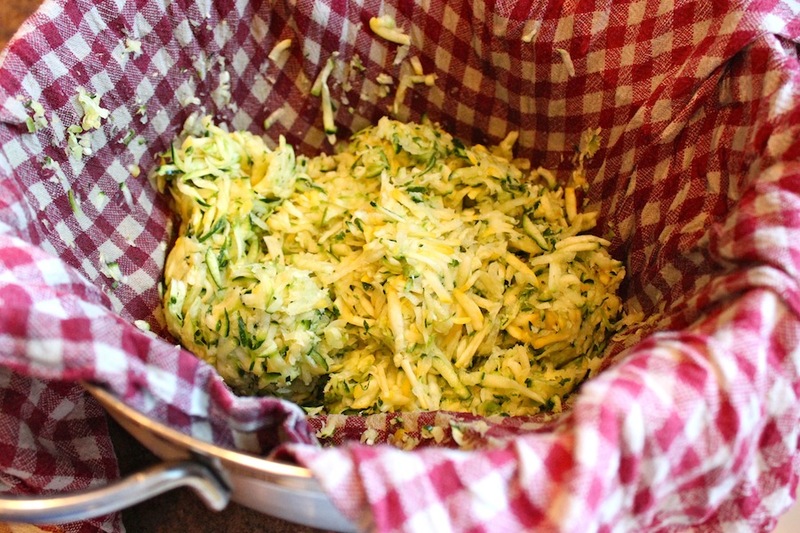 Set all ingredients in a food processor and pulse until smooth. Pour into bowl and refrigerate. Skin the salmon, trim off fat, de-bone if needed, and cut into about 4 (~4-5 oz) fillets. 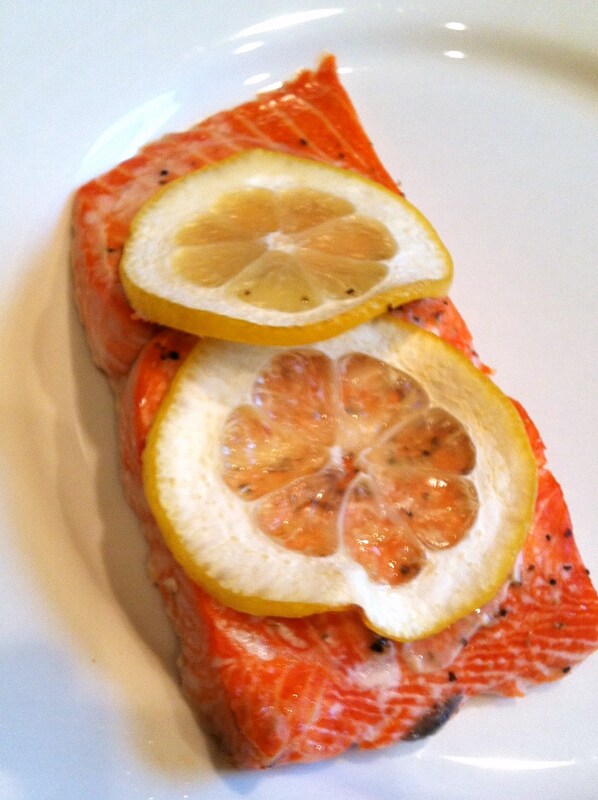 Set on a baking sheet lined with foil, season with salt and pepper, and lay 2 slices of lemon on each fillet. Bake at 400 deg F for about 17-18 min. Once removed from oven, discard lemon slices. Dish up the salmon, top with the cool cucumber yogurt sauce, sprinkle on fresh herbs, and enjoy! I really like the warm baked salmon with the cool refreshing sauce, but I’ve also made this with the sauce poured over the fillets and baked in with it (can leave off lemon slices). It’s great that way too. Either way, you have a simple, healthy, and SO delicious dinner that will leave you feeling great! 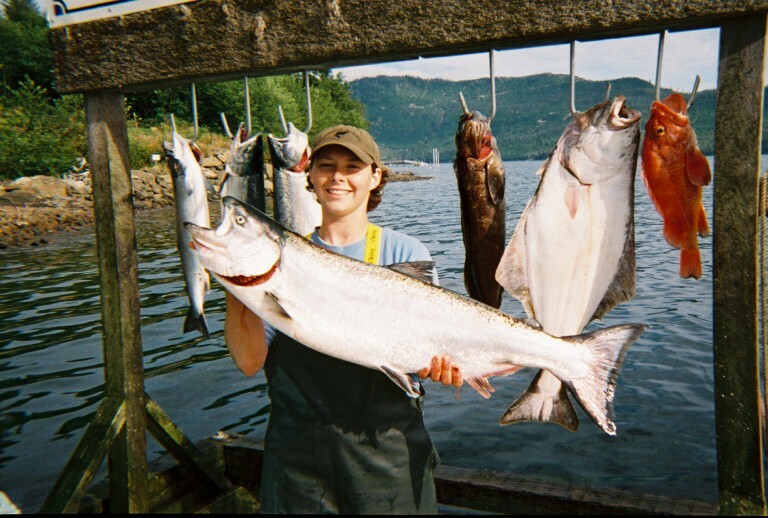 Oh and while I’m reminiscing back to my Alaska summers, here’s me with my 35 lb. King Salmon. Oh how I can’t wait to go back there.. Cheers! 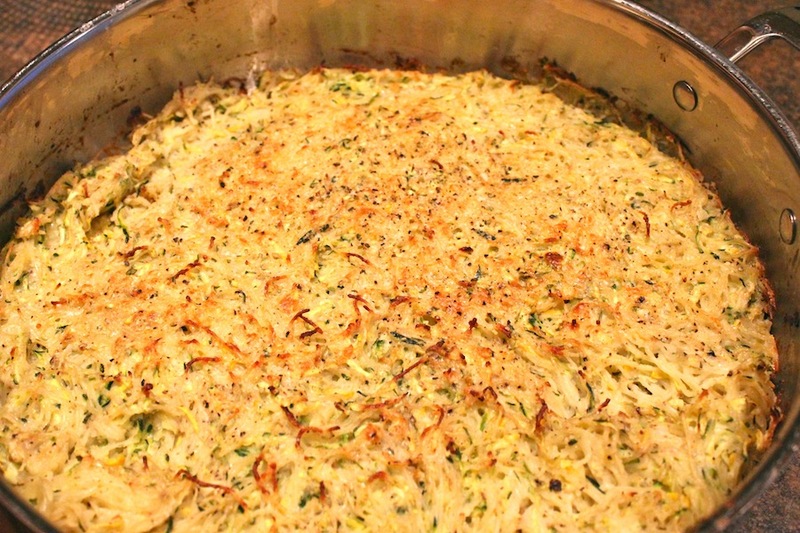 …And if you are inclined to make this dish, let me know how you like it! I love making pizza! And who doesn’t love eating it?? I have yet to meet some weirdo person who doesn’t like pizza! 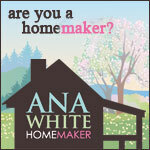 It’s so easy to make the dough, and while it’s rising you can get all your fixings ready. 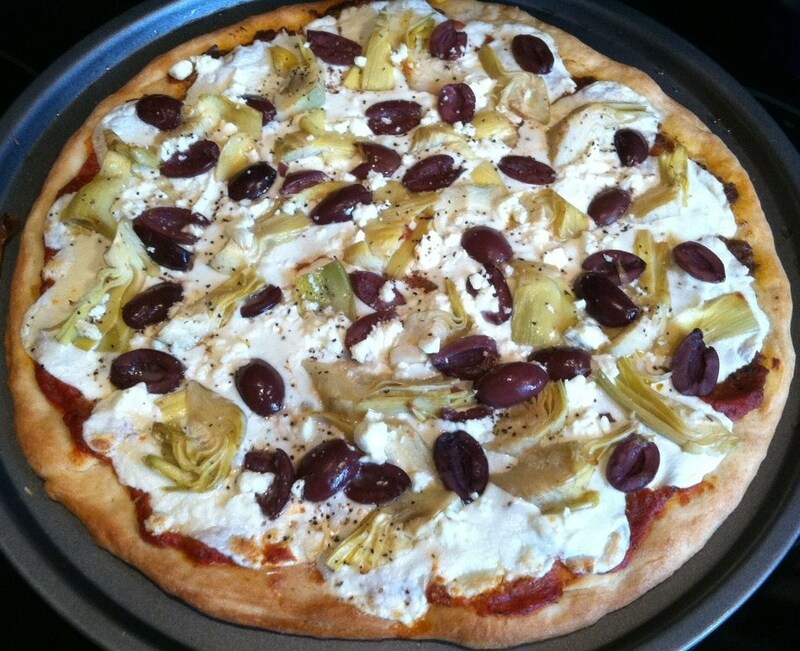 I recently got a big jar of Kalamata olives and artichoke hearts at Costco, and I’ve made this Greek Pizza three times in the last week!! It is so delicious. I spread on a little tomato sauce mixed with a sun-dried tomato pesto I had in the freezer, gave it a nice layer of fresh mozzarella and a little feta, and sprinkled on the Kalamata olives and artichoke hearts. A delicious set of pizza toppings, great for if you’re a vegetarian or just in the mood for a vegetarian meal. With the artichoke hearts and the olives this pizza seems meaty, without any meat. I would love to add on a little handful of pine nuts, but since my body just randomly decided to become allergic to them recently, I unfortunately won’t be adding those on! So weird, not allergic to anything else, but if I pop a couple pine nuts in my mouth, oh boy do I know it. Some slivered toasted almonds would be great too, for adding a little texture. I will note here that if you use any topping ingredients that soak/marinate in liquid and are a little wet, be sure to strain, pat with paper towel, and let set on the counter for a bit so you don’t end up with little water puddles on top of your finished pizza! The pizza dough I make is one my Aunt gave me quite some time ago. My cousin has the Pizza Dough recipe on her blog. It makes enough dough for two pizzas so I knead it, let it rise to double, punch it down, cut it in two, then use one and wrap the second one up and freeze it. 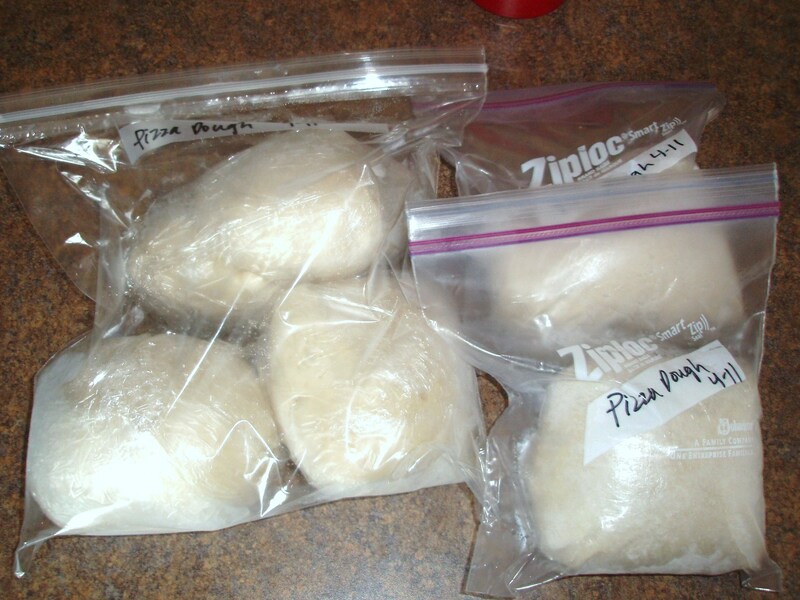 Or if you plan on using the second round of dough within the next day or two, just wrap it in plastic wrap and set it in the fridge. This week I made enough dough for 6 pizzas, portioned them into little rounds, let them rise once, wrapped them, and put them in the freezer. So nice to have pizza dough on hand to pull out of the freezer, especially perfect for using on a weeknight. Some tricks I do to get a very yummy pizza crust: press it/roll it out thin, so it will be a nice cracker-y thin crust and not too doughy. Drizzle with a little olive oil. Have your oven nice and hot, at least 425 F or 450 F, and if you have a pizza stone, have it in the pre-heating oven. Par-bake it for 7-8 minutes or so, until it just starts getting a golden tint to it. 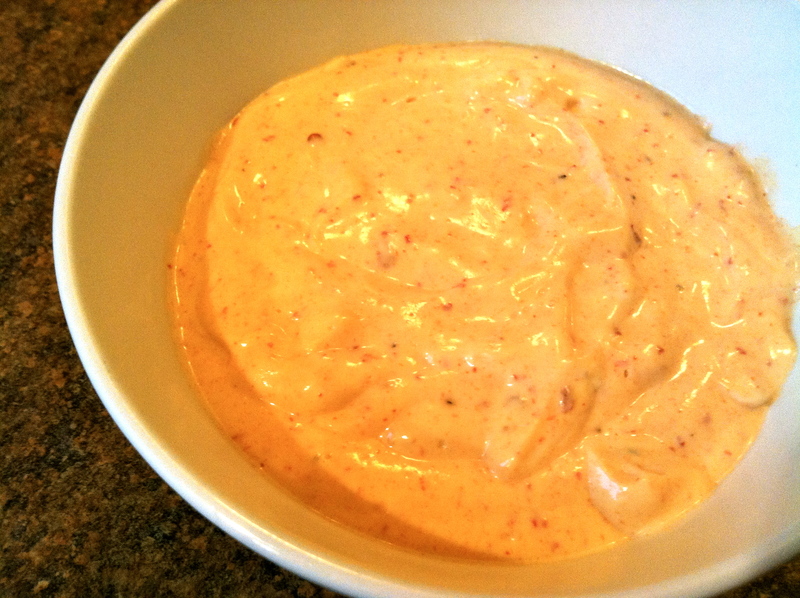 Then take it out and go to town with your sauce and toppings, and cook to your liking! …Emphasis on “Good”!! 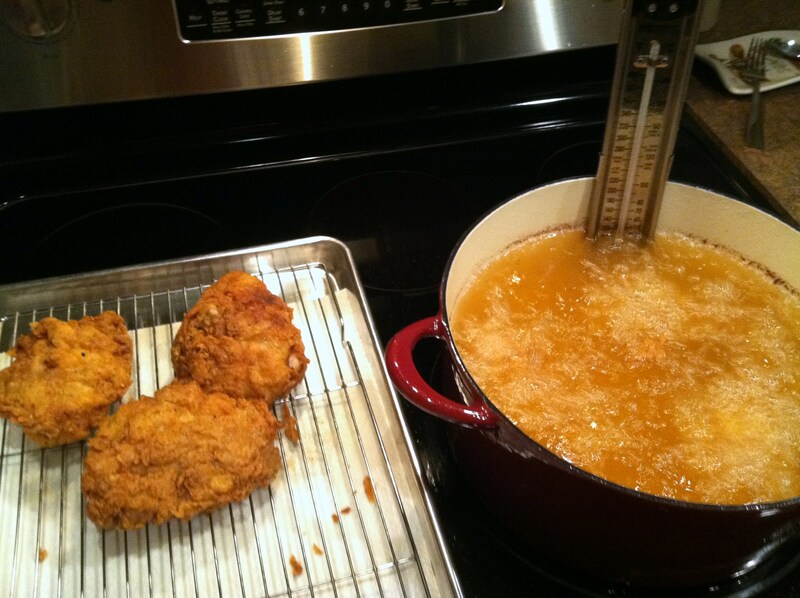 Ya’ll, this Buttermilk Fried Chicken is the best chicken I’ve ever had. You might see most young(-ish) couples out on a Saturday night, but Will and I… we’re spending the evening at home and cooking together. It was great. I always love to tackle some new, exciting recipe that I haven’t done before. And Will really enjoys being in the kitchen, cooking with me and being involved. One of my top three favorite cookbooks I have is Ad Hoc at Home, by Chef Thomas Keller. It is, like what an absolute favorite cookbook would be, chock-full of great recipes and beautiful photos. At the beginning of the book is his Buttermilk Fried Chicken, which has been jumping out and calling my name for a while now. Although I followed his instructions almost perfectly, I didn’t use a whole chicken and cut it into the ten pieces, but rather we just went and picked up a few thighs and a few drumstick pieces as I didn’t have the time this weekend to get a whole chicken thawed out and ready to go. My friends, it is worth the work and TLC. We were pretty excited about this dinner while we were cooking, and then while biting in to the crispy, crunchy, juicy, flavorful chicken, I couldn’t stop ‘MMM’-ing and Will was speechless. I said to him, “I don’t think I’ve ever made anything so delicious! 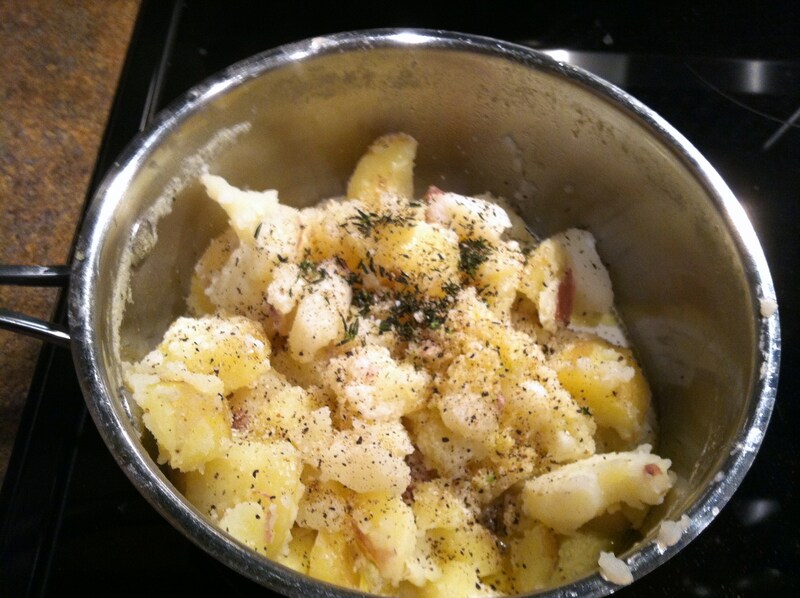 And I’ve made a lot of delicious things before!” To complete the meal I whipped up some of my garlic mashed potatoes. Well enough said. Here’s a few pictures, and here’s the cookbook, Ad Hoc at Home. I highly recommend this book, it is AMAZING. Not only does it contain many, many outstanding recipes, but is very educating on the basics of all you should know in the kitchen. For the mashed potatoes, I love making them. 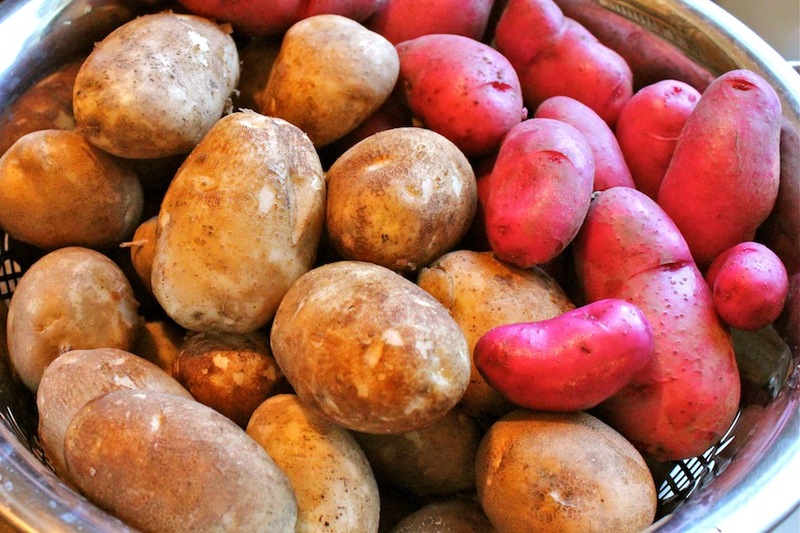 One of the first things I learned while working in the kitchen of an upscale fine dining restaurant, was what kind of potatoes to use for what kind of dish. For mashers, yukon golds are the best since they’re so creamy and buttery. Reds are good too. In my opinion, all those are a must for mashed potatoes. I do ’em up restaurant style, rich, buttery, and creamy. Here I sauteed a tbsp. 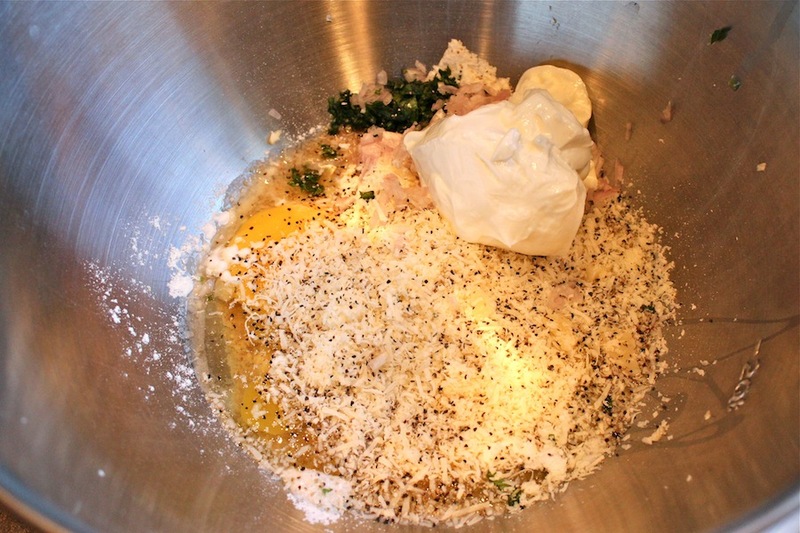 of minced garlic in a few tbsp. of butter, that makes a huge delicious difference. As for the recipe, well you’re going to get the book, right?!? Okay, it’s actually on that same link… right here for you. 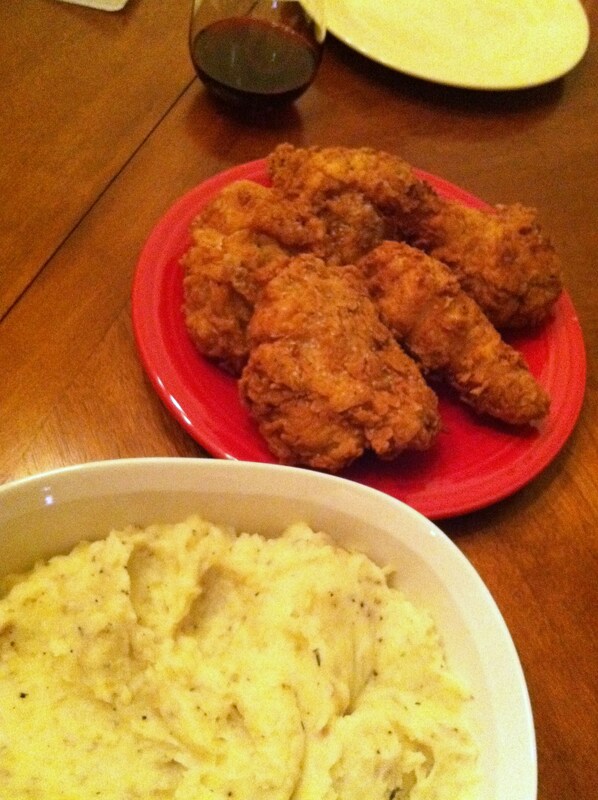 When I was young and we’d go to Bozeman to visit my grandparents, my grandma would sometimes make Oven-Fried Chicken with Mashed Potatoes and Gravy. I will always remember it. It was my favorite thing she made, and so I asked her if she’d make it for me for my birthday when I was in the 8th grade. I also called it ‘Chicken-on-the-Bone’ when I was a kid, so that has kind of stuck in the family and now gets my husband chuckling. Hey so I wasn’t so sophisticated about it and that’s what I knew it as! No boneless, skinless stuff for me, thank you! She did make it for my birthday, and I loved it. I now have her recipe, although I didn’t follow it totally tonight as I mostly did it from the Ad Hoc book rather than oven-fried, but next time I will make her dish. …With the gravy of course. I think she’d be proud and I will pass this on as THEE dinner to be made for special family and special times.